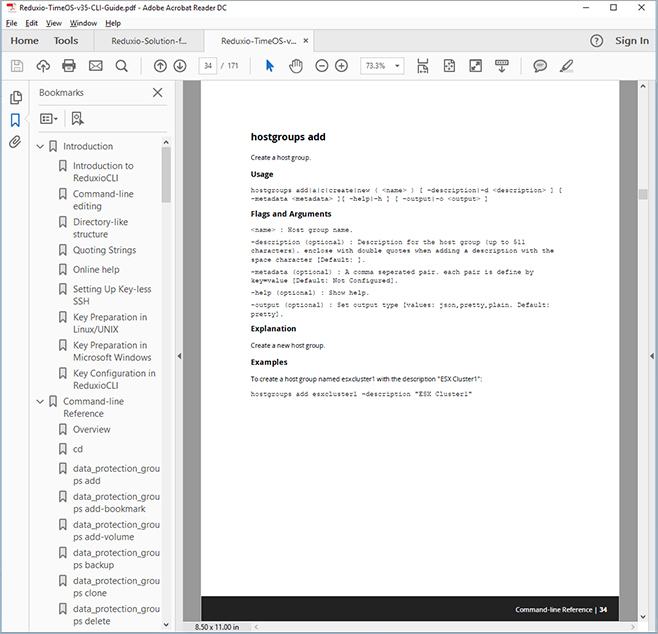 Migrate from Microsoft® Word to software that could facilitate efficient development and delivery of Reduxio’s documentation through topic-based authoring and content reuse. Streamline the ability to customize content for different product versions and audiences. Strengthen collaboration and ensure version control among Reduxio’s team of authors through integration with GitHub. Enable the visual consistency of documentation to support company and product branding. Return on Investment (ROI): Flare’s topic-based authoring enables Reduxio’s writers to deliver documentation four times faster. Responsiveness: Conditional tags and variables maximize content reuse and enable writers to produce PDFs that keep pace with software releases. Visual Consistency: CSS, templates, and table styles allowed Reduxio’s authors to match the look-and-feel of corporate branding standards and maintain consistency with minimal effort. Reduxio is redefining data management and protection with the world’s first unified primary and secondary storage platform in an industry that previously had seen no fundamental innovation for two decades. In fact, Reduxio customers report 3x to 20x performance gains and anywhere from 10x to 60x faster recovery of their data, virtual data images (VDIs), and applications. These users also cite the ability to recover data within one second, far exceeding the ability of other solutions on the market. Driving the performance of Reduxio’s unified storage platform is its patented TimeOS™ storage operating system (OS). Combining the OS with a range of other innovative capabilities, the platform provides breakthrough storage efficiency and performance while significantly simplifying the data protection process and providing built-in data replication for disaster recovery. 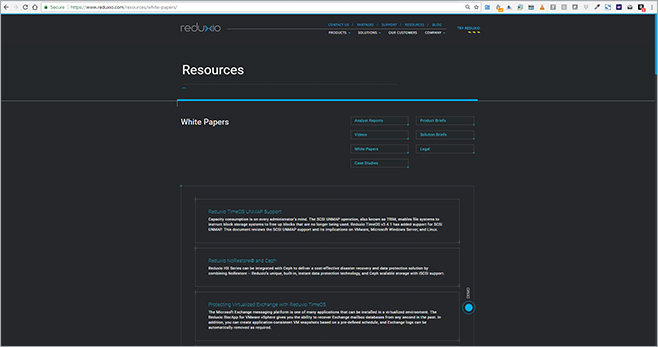 To assist customers in using the products within its platform and integrating these products with other applications and platforms, Reduxio provides technical documentation via its corporate website and support portal. Today, the company relies on MadCap Flare’s topic-based, single-source publishing functionality to create and deliver this content. As a result, Reduxio has been able to significantly reduce project time from over a month to just one week. For years, Reduxio’s technical marketing team relied on Microsoft® Word to develop and produce its PDF-based documentation. As the team expanded, maintaining a consistent document production workflow and collaborating on the same documents became increasingly difficult. Additionally, since the team performed and documented integration testing of Reduxio’s products with other enterprise applications and operating systems, it was important for them to have the ability to easily finalize and publish these documents after conducting the tests. Traitel began looking for a more flexible solution that would enable the authors to deliver content faster and visually enhance the documentation, and his search led him to MadCap Flare. He was immediately attracted to its native XML, topic-based authoring, and cascading style sheet (CSS) capabilities. Developing content in Word just felt outdated. It was impossible to change the look and feel of the documents once they were in place. We also wanted to speed up the documentation production process, as well as streamline our authoring efforts by doing less manual work. Today, Reduxio supports users by providing two sets of PDF-based documentation: one set publically available to anyone visiting the company website and another for customers only. The public set of documentation is accessed via a content repository located in the Resources section of the site. 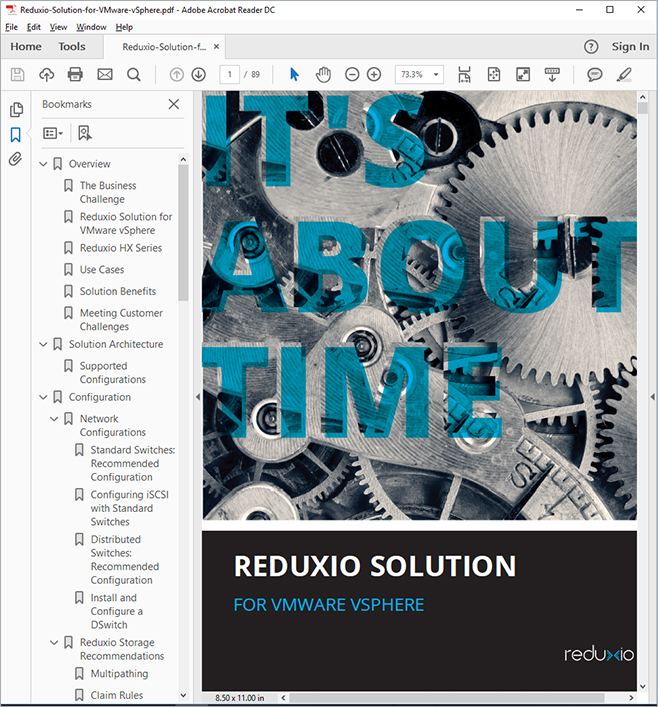 It includes whitepapers and product guides on how to effectively use Reduxio’s products and integrate these products with common applications and platforms. Meanwhile, the private set of documentation, such as admin guides, runs through the Zendesk knowledge base and can be accessed and downloaded by customers through a login. Flare’s topic-based authoring has saved us hundreds of hours per year. We can now get new content out to production within hours of coming up with an idea simply by copying and pasting the TOCs and mixing in existing content. By taking advantage of MadCap Flare’s topic-based authoring and table of contents (TOC) feature, the technical marketing team has been able to significantly speed the production of Reduxio’s documentation. “Flare’s topic-based authoring has saved us hundreds of hours per year. It’s enabled modularity of our documentation and lets our writing style be more explicit. We can now get new content out to production within hours of coming up with an idea simply by copying and pasting the TOCs and mixing in existing content,” Traitel says. The team also has maximized content reuse and gained additional efficiencies through the use of conditional tags and variables in MadCap Flare. Conditional tags are applied to specific sections of content for different versions of Reduxio’s software releases, so that those updates are automatically made once the releases are published. Meanwhile, the ability to automate changes across all files via variables has drastically streamlined the process of creating content. It used to take us an hour just to start work on a new white paper and more than a month to complete when we used Microsoft® Word. Now, it takes us just five minutes to initiate a new white paper and only one week to complete! Recently, Reduxio’s technical marketing team has expanded. To foster collaboration and synchronize authoring efforts, the team takes advantage of Flare’s integration with GitHub, a web-based Git repository hosting service for version control. We were already using GitHub for source control management, so Flare’s smooth integration with GitHub made it super convenient for us to also store our documentation sources there and share our work across the team. It’s been a huge benefit. In the past, using Word to maintain the same look-and-feel for new documentation was difficult, and it was nearly impossible to standardize manual steps, such as having to place an image the same way every time, with multiple people working on Reduxio’s documents. Thanks to MadCap Flare’s CSS and table styles, the look-and-feel of our documentation is standardized and much more visually appealing than before. 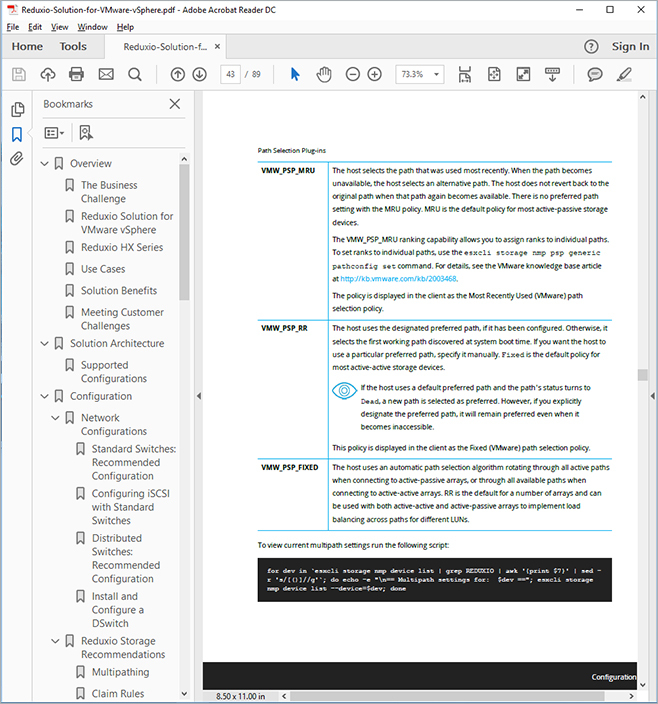 Today, Reduxio’s writers leverage features in MadCap Flare to visually enhance and standardize its PDF-based documentation. Among these features are cascading style sheets and table styles, which allow the authors to establish a format for structuring the look-and-feel of content, including tables, pages, and headings. This also helps them to standardize elements that support company and product branding, such as color schemes and fonts. Additionally, by utilizing CSS templates in Flare, the team has been able to update and maintain content more quickly than before, ensuring that customers are accessing the most up-to-date PDFs. “The CSS templates make it super easy to update all of our documents with the same look-and-feel whenever we create new versions, which was impossible to do in the past even if we didn’t have a large amount of documentation,” Traitel observes. Based on the success of delivering PDFs, Reduxio is now looking to use Flare to enrich the end-user experience by delivering the admin guides in HTML5 format directly to the external website.